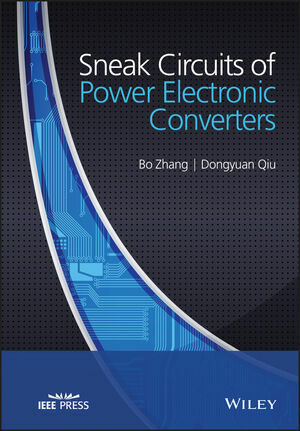 The work on sneak circuit and its analysis methods for power converters contributes to the reliability of power electronic systems worldwide. Most books in the subject concentrate on electronic systems, but this book is perhaps the first to examine power electronic systems. It describes the sneak circuit phenomena in power converters, introduces some SCA methods for power electronic systems and proposes how to eliminate and make use of sneak circuits. The book is divided into three separate sections. Firstly, the sneak circuit paths and sneak circuit operating conditions are discussed in different kinds of power converters, including resonant switched capacitor converters, basic DC-DC converters, soft-switching converters and Z-source converters; Secondly, the sneak circuit analysis guidelines for power converters based on generalized matrix, adjacency matrix and Boolean matrix are presented respectively; Thirdly, the sneak circuit elimination techniques are introduced and verified in several power converters, with applications of sneak circuits described in conclusion. Written by a lead author with extensive academic and industrial experience, the book provides a complete introduction and reference to students and professionals alike. Contents include: Fundamental Concepts, SCA of Resonant Switched Capacitor Converters, SC of DC-DC Converters, SC Analysis Method (including Boolian Matrix), and Applications of SC in Power Converters.